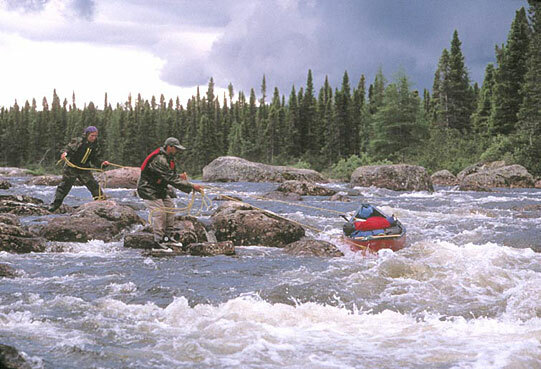 BREAKING THE BROOK – Jim Niedbalski and Brad Bassi lean into the relentless and buggy upstream toil involved in tracking up Susan Brook, the wrong route into Labrador, fatefully done by Hubbard, Wallace and Elson a century ago. The group did the 650-mile 50-day retracing of the famed trip. 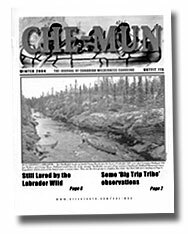 I first learned about the 1903 Leonidas Hubbard expedition by reading Great Heart: The History of a Labrador Adventure, by James West Davidson and John Rugge, but it wasn’t until the afternoon of July 4th, 2003 that I began to understand how truly difficult the trio’s journey into Labrador’s rugged interior had been. On that day, Jim Niedbalski, Brad Bassi and I reached the intersection of Susan Brook and Goose Creek and located Hubbard’s final campsite among the evergreens. We hadn’t made the trip by helicopter or float plane as most of the 20 or so visitors to the site have done since Hubbard’s death. Instead, we were the first team in a century to reach the memorial site by canoe. The Hubbard Memorial Centennial Expedition was a 650-mile, 50-day canoe trip in Labrador and Quebec retracing the 1903 route of the Leonidas Hubbard expedition up Susan Brook to Hope Lake then northwest to Lake Michikamau (Smallwood Reservoir) and continuing on the 1905 routes of the rival Mina Hubbard and Dillon Wallace expeditions through Smallwood to Cabot Lake and down the George River. The expedition began on June 24th in North West River, Labrador (which by sheer coincidence was also Wallace’s birthday) and ended on August 12th in the Inuit village of Kangiqsualujjuaq, Quebec (formerly George River Post), which is located on the southeast side of Ungava Bay. 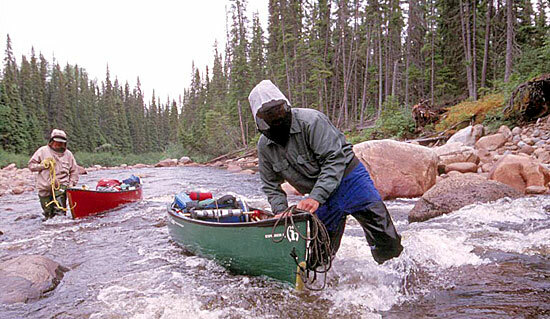 We based our planning on experience gained on five previous canoe trips in the Nunavik and James Bay regions of Quebec, dating back to 1992. 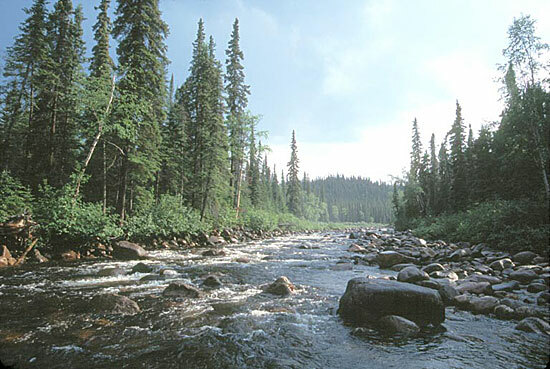 Although Jim and I had gained some upstream experience during a successful 1999 crossing of the Ungava Peninsula, there was nothing that could have prepared us for the backbreaking labor of ascending Susan Brook, Goose Creek and the Beaver River. Because of the difficulty we had anticipated on this 150-mile upstream phase we pared our equipment down as much as possible, but we still cursed the heavy loads. Our only resupply occurred on July 17th at Alan Gosling’s cabin on Lake Orma Road, which lies 38 miles north of the town of Churchill Falls and seven miles southeast of Smallwood. Caroline Scully, the fourth member of our team, met us at the cabin and traveled with us, after a much-needed two-day respite, on the second phase of the journey that stretched 500 miles downstream to Ungava. Each phase of the trip took 25 days to complete. We had the good fortune of speaking with Max McLean in North West River shortly before pushing off from a small beach in front of the old Hudson’s Bay Company Post, where all three original expeditions began. The building now houses the Labrador Heritage Museum. The museum has a very extensive collection of artifacts and photographs from the Hubbard expeditions. Max is a member of the museum’s board of directors and is a direct descendent of Duncan McLean, who was one of the trappers on the 1903 rescue party as well as a member of Wallace’s 1905 expedition. His other uncle, by marriage, was Gilbert Blake, who was also a member of the party that rescued Wallace. Blake later joined Mina’s 1905 expedition. Max, who is now in his early 80s, trapped along the Naskapi River in the 1940s with his father. He has wise, aged eyes and a hearty smile and his bright white hair covers just the fringes of his head. He was very pleased to see that we had taken such an interest in the land and the Hubbard story. Max mentioned that he would love to go back up the Naskapi, but was simply no longer able due to his advanced age. He seemed happy to have us head into the bush in his place. He confirmed that no one had successfully followed the ‘03 route and seemed very excited about the prospect of our success. “It would be good to see someone follow Hubbard’s route to show that it can be done,” he said. He shook our hands, wished us well and said that he was going to go have himself a beer. He waved as he pulled out of the dirt parking lot in his pick-up truck. A few minutes later we took our first expedition paddle strokes in nearly four years. Grand Lake was as still as glass that first evening and only the chirps of frogs and the hum of a few mosquitoes permeated the thin walls of my tent. The next day we reached Cape Law. It was at this point that Hubbard’s troubles began. He had been advised at the post that the Naskapi flowed into the end of Grand Lake and from Cape Law it was easy to see how he had mistaken the Susan for the Naskapi. Across the lake to the north was the mouth of the Naskapi River. Several layers of relatively flat, uninteresting hills separated the surface of Grand Lake from the interior. To the west, which clearly looked like the end of the lake, was the Susan Valley. The view was much more mountainous in this direction and I could see deeper into the interior. Therefore, from a strictly visual standpoint, the view of the Susan Valley would have exerted a much greater pull on Hubbard’s adventurous heart than the mouth of the Naskapi. Hey hey, ho ho. Up the Susan we go, go, go! We knew it would be the toughest 20 miles of the summer and by the end of the first day we had gotten a glimpse of what the Susan had in store for us - and it wasn’t pretty! The riverbed would rise 1,000 feet in just 20 miles; the shorelines were choked with alders and the air was heavy with humidity. The woods were a tangle of spruce limbs and deadfall, with an occasional trip-ending sinkhole thrown in to make the near impossible task of portaging even more challenging, and the forest was so dense at times that it was impossible to turn the boat while carrying it. All we could do was stumble in the direction the trees channeled the hull and hope to make a first down. Most of our portage attempts ended with a loud crash and the type of word that shouldn’t be spoken at a Thanksgiving dinner. It quickly became apparent that we had to stick to the river whenever possible.